The Heavy/Duty Mini Grapple Bucket is designed for site clean up, ground levelling and sifting out debris. This Grapple is the heavy duty version,25mm round bar tynes,5mm back sheet,75x50x5 RHS heel & top section,8mm full scallop sides,12mm prongs,flat bar protection of ram. Hydraulically operated the grapple is fitted to the rock bucket to provide a grabbing arm to trap and contain debris. 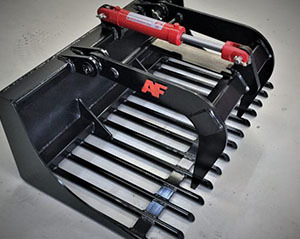 Hydraulic Grapple attaches to the Mini Rubble Bucket. *More effective to carry material. * Grapple suit both models of the Rubble Bucket. Clearing Construction Sites, Sifting Debris and much more. Mini Loaders and small skid steers.